Jan 08 Comments Off on Going Overboard on Bleaching? 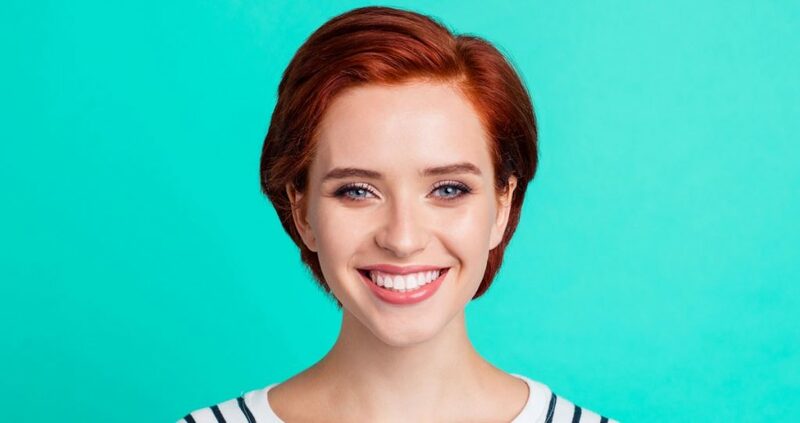 Teeth whitening products have given people the opportunity to smile brightly after years of staining their teeth with coffee, tobacco, tea, and other products that aren’t good for dental health and tooth color. However, they’ve also given rise to a new issue that dentists have begun calling bleachorexia. Bleachorexia describes the act of over-bleaching one’s teeth to make them as white as possible. Not only do overtly white teeth look unnatural, but the act of over bleaching them can actually destroy them. Therefore, it’s important to know the effects of bleachorexia and how to prevent them. Bleachorexia can cause several effects that range from simply uncomfortable to downright painful. The intensity of these effects depends on how often a bleaching product is abused, the starting condition of the user’s teeth, and the particular product being used. A bleaching agent works by using peroxide to lessen the effects of stains that have built up by drinking coffee, tea, smoking, using chewing tobacco, and other habits that aren’t good for the coloring and health of teeth. This peroxide is fairly strong and it causes teeth to become very sensitive to varying temperatures. However, it’s usually not a permanent problem if the user stops using the bleaching product. The sensitivity will typically cease soon after the bleaching agent is removed from the user’s teeth cleaning regimen. Another common effect of bleaching is irritation in the gums and throat. This is another symptom that’s caused by the peroxide used to whiten the teeth. The gums and throat simply aren’t good at resisting corrosive chemicals such as peroxide. It’s not a very serious side-effect of bleachorexia, but it is an annoyance and it’s avoidable by using ADA-approved products, or by having a licensed dentist perform the whitening. The most serious side-effect of over-bleaching is tooth erosion. If teeth are exposed to bleaching agents too often and for too long, the enamel that protects teeth is destroyed. This causes a number of long-lasting oral health issues and quite a bit of pain. 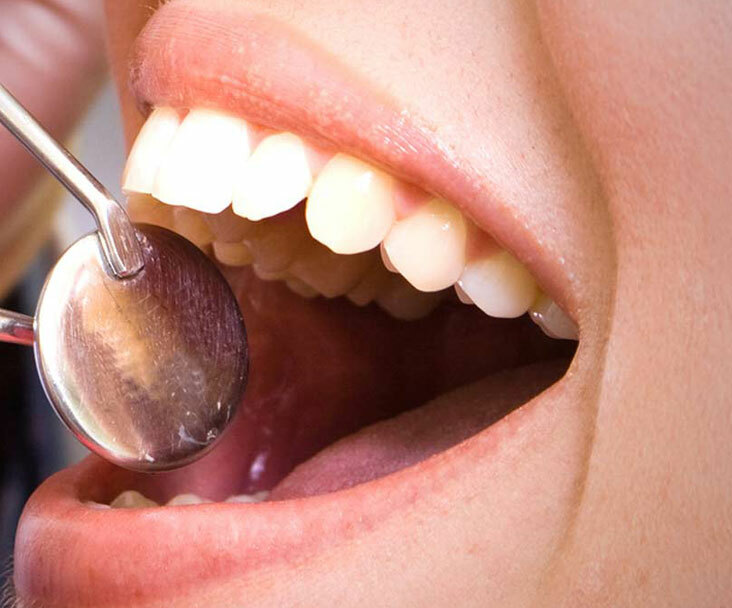 After an individual bleaches the enamel off of their teeth, professional help is a necessity. It’s best to simply have a professional do the bleaching properly to avoid the effects of improper bleaching. 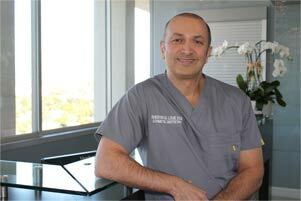 Dr. Louie is a cosmetic dentist in Los Angeles. He recommends using only ADA-approved products for teeth whitening. It’s also recommended to use them under the watchful eye of a licensed dental expert. However, Dr. Louie also provides his patients with ADA-approved kits that they can use at home. That removes the guesswork involved in finding an effective product. 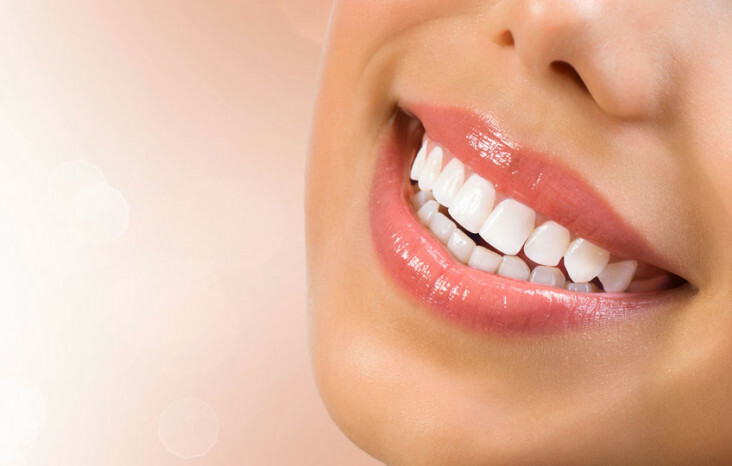 If you’re looking for professional teeth whitening services, you’ll find some of the best at Smile in LA. 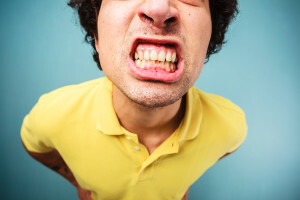 Jun 15 Comments Off on Bruxism: The Seemingly Harmless Habit That Could Literally Make Your Teeth Fall Out! Bruxism: The Seemingly Harmless Habit That Could Literally Make Your Teeth Fall Out! Do you sometimes find yourself waking up some mornings with a headache you can’t seem to explain? Have you experienced slight muscle pains in your face? If you answered “Yes” to these questions, you may be suffering from bruxism. Bruxism is more commonly referred to as “teeth grinding” or “jaw clenching”. This nasty habit seems harmless, but should not be ignored. The truth is, bruxism wears your teeth down and sets you up for cavities and makes you vulnerable to tooth fractures. 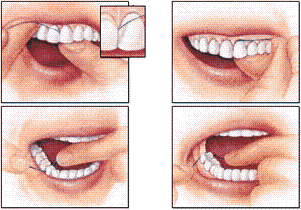 If not addressed, worst case scenario is that bruxism will contribute to tooth loss. Below are ways to better understand bruxism and how you can address the issue to save your smile. Here at Smile in LA, we’ve understand that many factors can combine to create a bruxism habit. It is believed that anxiety and stress are the leading causes of bruxism. A misaligned bite, having missing teeth, or sleep abnormalities can also contribute to bruxism. There have also been some medications known to trigger episodes. Even neurological or musculature illnesses have been linked to the development of bruxism. If you’re are currently experiencing facial pain or discomfort due to bruxism, give us a call at (323) 461-9353 and schedule an immediate appointment. Isn’t it Common for People to Grind Their Teeth? Teeth grinding may be a common issue amongst the population, but that does not mean this action is necessarily “normal”. Due to the fact that the stresses of bruxism affect your entire jaw, this pressure has been known to create cracks and chips in teeth. Over time, this can lead to jawbone loss which will result in a shortening of lower face height. For this reason, signs of bruxism should not be ignored! Los Angeles Dentist Dr. Shervin Louie of Smile in LA is pretty sure that is not a look you’re are looking to capture! How Do I Know I Have a Bruxism Problem? In a majority of cases, we are able to see evidence of bruxism in your X-rays, an also from examining for signs of bruxism on the surface of your teeth. We will alert you about any bruxism issues we see long before you exhibit a single symptom, especially if you sleep alone (which makes bruxism harder to notice). However, you might notice that you may occasionally begin to clench and grind your teeth between visits and start to notice bruxism symptoms on your own. 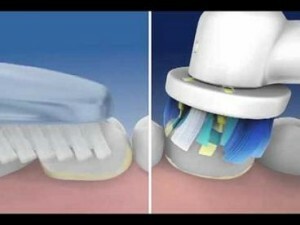 If this explains your current situation, and you find that you frequently awake with a sore jaw, a headache that goes away shortly after rising, or if a loved one tells you your teeth are making odd “clicking and clanking” noises all night, be sure to mention it the next time you’re visiting our Los Angeles dental practice. Due to the varied cases of bruxism, treatments options vary as well. For example, should we determine stress as the primary cause of your bruxism, we will recommend you abstain from excessive caffeine as well as alcohol, while including some form of daily relaxation. Even something as simple as taking time to soak in a warm bath before sleeping can work ease your body and mind working to stop your bruxism habit. Now, if your bruxism is a bit more serious, and your bite is of concern or if Dr. Louie suspects your bruxism links to a TMJ disorder, he will use his expertise to assist you with the root cause. In either case, we still like to start out with recommending an occlusal mouth guard to protect your teeth and jawbone from further damage. Protective devices like a sleeping mouth guard are easy to wear, and best of all – will not disrupt your ability to get a peaceful night’s sleep. As a matter of fact, sleeping guards tend to improve your quality of your sleep resulting in you waking up more refreshed and feeling well rested. Patients using sleeping guards have reported to snore less or stopped snoring, as well as awake with less facial pain. So, the next time you’re sitting in for your dental visit at Smile In LA, ask if some sort of sleeping guard may help with your bruxism. It is common for many people go years without ever being aware of the fact that they are clenching and grinding their teeth since it takes some time for symptoms to show and be recognized. Getting a mouthguard once you are aware you have this habit will help you find relief from related headaches and muscle pain. Call us at (323) 461-9353 or visit our website for more information on how we can help you. You may think twice about avoiding the dentist once you realize how a simple dental visit can lead to an early diagnosis to other issues in your body. Advances in medical technology has really made some huge leaps in the last few years. These marvelous advances in the dental radiography world has made it possible for you to get a more detailed diagnosis from dental x-rays next time you visit the dentist! Los Angeles dentist Dr. Shervin Louie has always taken pride in keeping his practice up-to-date with the latest dental technology. He is able to provide his patients with more than just dental care. 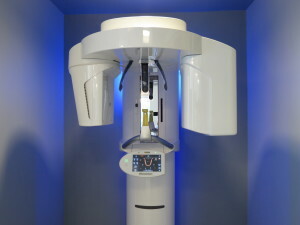 With the help of his 3D Cone Beam Computed Tomography Scanner he is able to detect other health issues to improve the overall wellness of each and every one of his patients. This 3D CBCT Scanner is able to get clear images of your temporomandibular joints. These joints are a vital location to your face and jaw. When your temporomandibular joint dysfunctions, it can cause a range of symptoms such as jaw pain, headaches, the sensation of overloaded neck muscles, limited ability to open your mouth, clicking while moving the jaw, or jaw clenching. Visiting Los Angeles dentistry Smile in LA will allow Dr. Louie to scan your jawline with the latest dental technology allowing you to get much more detailed treatment compared to other dentist who still use 2D scanning methods. 3D x-rays can also allow your favorite Los Angeles dentist to capture a vivid visual along your airway passages to help diagnose sleep apnea, snoring issues, and restless breathing. The scanner is able to let your Los Angeles dentist know the size of your airway passages, see the nasal complex, and your pharynx (which is the membrane-lined cavity behind your nose and mouth connecting to your esophagus). Visiting Los Angeles dentistry Smile in LA might just be the solution you needed to helping resolve restless nights due to sleep apnea or snoring. Due to the fact that a 3D CBCT scanner can scan your entire head and get multifaceted images of your nasal passages, it can allow your dentist to discover if a sinus issue is due to a problematic tooth. This diagnosis is possible since your dentist can turn and motion your x-ray to see any angle of your entire head. This shows Dr. Shervin Louie problematic areas that can not be seen in the typical 2D x-rays. To experience modern dentistry at its finest, visit everyone’s favorite Los Angeles dentist Dr. Shervin Louie over at Smile in LA. Call his friendly staff to schedule your next dental appointment today or visit www.smileinla.com for more information. You probably already know about traditional string floss. But do you know if you are using it correctly? People have been flossing for years. But Los Angeles dentist Dr. Shervin Louie of Smile in LA says many patients are surprised to hear that they have been flossing the wrong way the entire time. There really is a wrong and right way to floss your teeth. Also, there are more tools for flossing available to you than you may think. In addition to string floss, floss picks, water flosser, and interdental floss brushes are available to you in your local store! 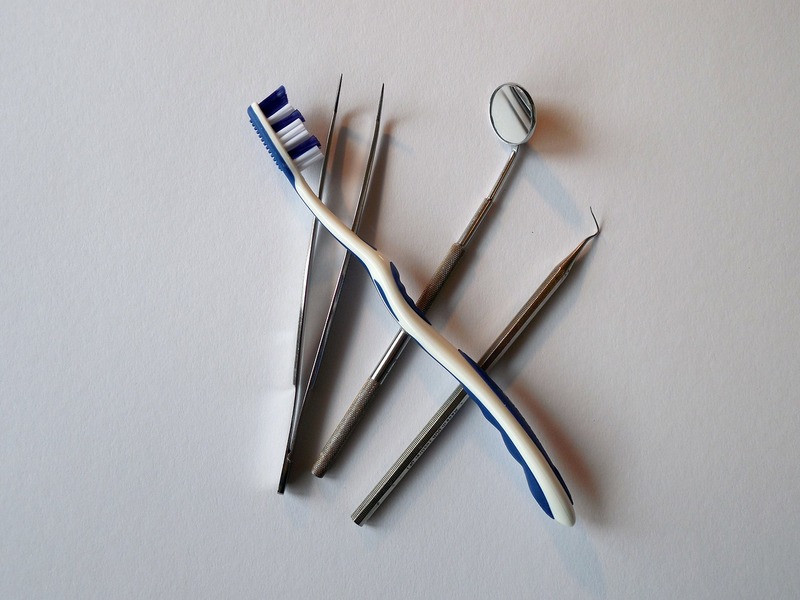 Each tool has it’s advantages and when used together can really optimize your oral health. Below Dr. Louie provides you with ultimate guide to flossing. You can learn about proper flossing techniques as well as discover what tools are best to use in your oral care routine. 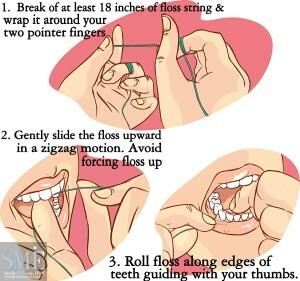 String flossing is the most traditional tried-and-true technique to flossing that most individuals practice at home. If you notice light traces of blood on your floss or notice a bit of blood after flossing while brushing your teeth, you may be flossing to hard. Do your best to avoid forcing floss in between teeth. It can snap through all the way up to your gums and cause slight tissue damage. This tissue damage will cause gum sensitivity as well as cause light gum bleeding. Floss picks are essentially toothpicks with a strand of floss at the opposite end. They are used to floss in between teeth as well as pick food out that may get stuck behind wire braces. Since you can’t wrap your finger around the floss on a floss pick, you want to pay attention to how you floss. 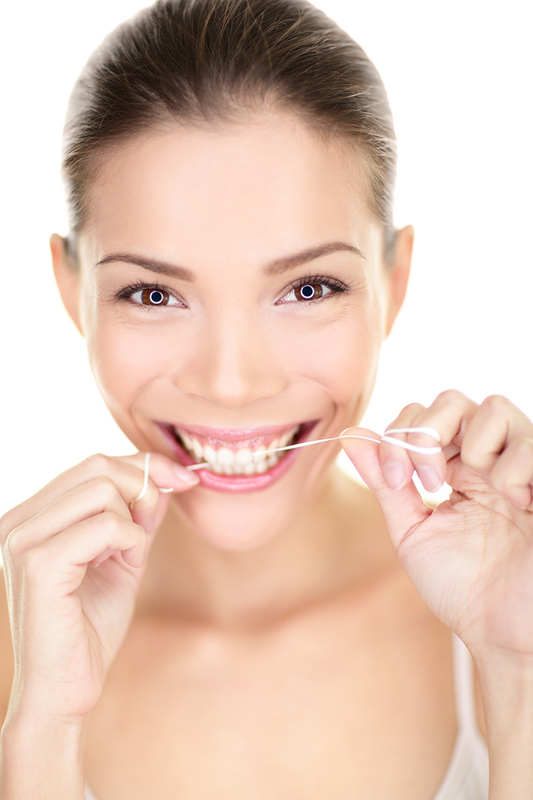 Do your best to avoid forcing the floss through your teeth. The best technique to use to gentle glide the floss upward back and forth until the floss is able to fit between your teeth comfortably. Guide the floss to rub up along the curvature of teeth along the top all the way until you pull it out repeating the process with each tooth. There is a long list of benefits that a water flosser can provide you. Water flossers are able to clean deeper into gum pockets than traditional floss reducing your chances of developing periodontal (gum) disease or gingivitis. This makes it especially beneficial for those who suffer from diabetes who are at greater risk for gum disease and gingival inflammation. Those who floss too hard and as a result suffer from light gum bleeding can also greatly benefit from using a water flosser. A water flosser can also greatly assist those with orthodontic appliances! Especially those with braces who struggle flossing around their wire framing. 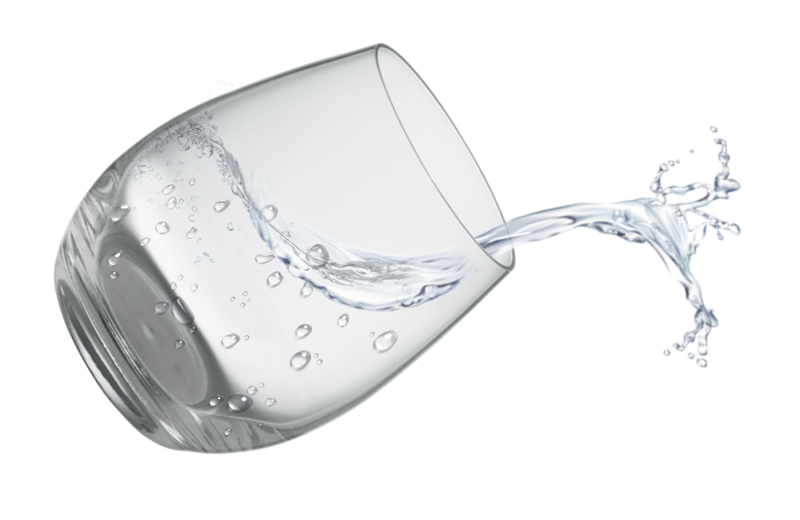 The way a water flosser works is that it utilizes water pressure to essentially blast away plaque and stuck on food. Many people have implemented flossing into their oral health routine, but not enough people have integrated interproximal plaque removal as a part of their oral hygiene habits. Interdental brushes remove plaque that builds in between larger gaps of teeth. Gaps that are too wide for thin traditional floss to clean. Interdental brushes really do combine the best of both worlds – flossing and brushing! To use an interdental brush, you want to first figure out what size brush you need. Do your best to avoid forcing larger interdental brushes into tight places. Never force the interdental brush into your gums. It will cause damage and possible bleeding of gums. The bigger the gap you are trying to clean, then the wider or thicker the interdental brush needed will be. Once you have figured out what size you need, you then simply place the interdental brush in between the gap and slide it back and forth to in a sense brush the sides of the tooth clean removing plaque as you move along. Los Angeles dentist Dr. Louie also advises to invest in an interdental brush that can bend at a 90 degree angle to reach those tough bicuspids and molars. Utilizing these techniques while flossing every morning and night can greatly benefit your oral hygiene. Be sure to maintain a healthy smile by scheduling your next routine dental visit with Los Angeles dentist Dr. Shervin Louie of Smile in LA. Don’t forget to share this blog post with friends and family to ensure everyone’s oral health is in good standing. For those of you wishing to avoid antibiotics for gum disease, natural remedies may offer relief, depending on the severity of the infection. According to Dr. Shervin Louie, your Los Angeles dentist infections in the gums can form from various reasons ranging from injury to the tissue, and more commonly, to the presence of periodontal gum disease. Because natural remedies may not fully remove a gum infection, a dentist should be consulted if pain, swelling, bleeding or redness persists. For the early stages of gum infections or irritation, rinsing the mouth with warm salt water may be helpful in preventing the infection from fully forming. According to Dr. Louie, your Los Angeles dentist a graduate and past faculty member of USC, you should dissolve one teaspoon of salt into a 8oz cup of warm water. The water should be as warm as you can stand it. Allow the salt to fully dissolve and rinse the mouth for 2 minutes, twice a day, after breakfast and before bedtime. Vitamin C is necessary for overall health of the body, and especially for the gums and teeth. 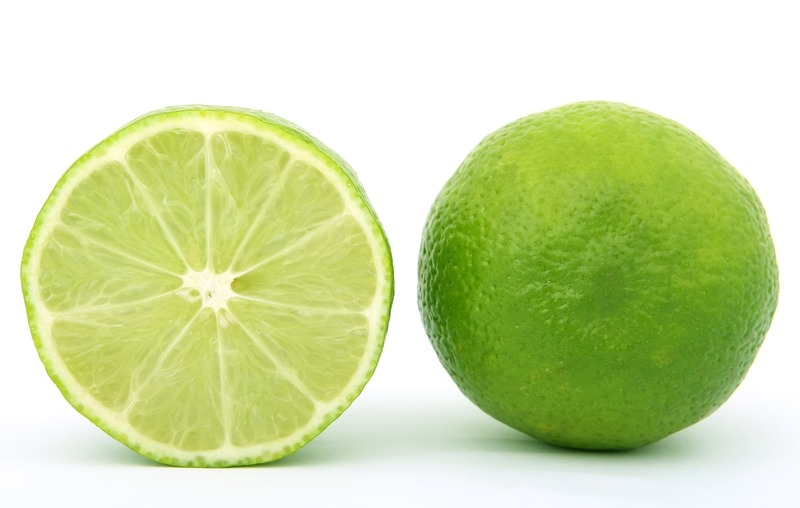 Vitamin C has antioxidant properties that fight infection and help to build strong, healthy gums. Vitamin C powder can be topically applied to gums that are irritated or infected. This should be done several times a day and repeated until the infection is gone, according to Dr. Louie. In addition, grapefruit seed extract, which is high in vitamin C, can be used to treat a gum infection. This product is high in antioxidants and possesses antibiotic properties as well, helping to fight oral disease. A drop or two can be added to the toothbrush when brushing once or twice a day. Alternatively, make a swish with a few drops of grapefruit seed extract in a cup of water and rinse the mouth until the infection is gone. Oscillating Power Toothbrush Hollywood brushes–those that rotate in one direction and then the other–removed up to 11% more plaque and reduced bleeding of the gums by up to 17% more than manual or other power toothbrushes, according to results compiled by the Manchester, England-based Cochrane Oral Health Group, which analyzed data from clinical trials conducted over 37 years. According to the findings for Evidence-Based Dentistry, only the rotational oscillation toothbrushes proved more effective than manual toothbrushes in reducing plaque and gingivitis. The results did not explain why the rotational oscillation toothbrushes were more effective than power toothbrushes with only circular or side-to-side motion. While the study does not deal with long-term benefits to dental health, Dr. Shervin Louie your Los Angeles dentist believe that it’s a preventive step. It reduce bacterial plaque that causes disease he said of the rotating oscillating brushes. The motion of power toothbrushes is up to 100 times that of manual brushing. That still doesn’t mean that every man, woman and child should abandon the toothbrush that they’re currently using. Someone using the simplest manual toothbrush with good knowledge of how to brush and conscientious brushing can do just as well as somebody using a power toothbrush regardless of the design. What this review is telling you is that an average person putting in an average effort is going to see a better effect than using other brushes. If you can afford a rotational oscillating power toothbrush and it feels good to you, it offers modest improvement in ability to clean your teeth, then buy one. No matter how impeccable your oral hygiene is, dental emergencies may happen. This is especially true during the summer months when it is warm outside and you spend a lot of time participating in activities like bike riding, playing football or other outdoor sports. While these activities are fun, they put us at risk of damaging our teeth due to things like falling or getting hit in the face with a ball. Fortunately, when dental emergencies arise, a cosmetic dentist can often save your teeth. It is best to try to avoid dental accidents if at all possible, but when a dental emergency does arise, knowing what to do can make all the difference at being able to save your tooth. Here is what you need to know. If your face suffers from some kind of impact, you can lose a tooth. This impact can be caused from things like tripping and falling down or a hard hit during a recreational sport. No matter what causes your tooth to be knocked out, you need to take action immediately. Your first step should be to take the tooth that’s been dislodged and rinse it off with water. Put the tooth back into place and contact your Los Angeles dentist. If you aren’t able to put the tooth back into the socket, put it in either a cup of salt water or milk. This will help save your tooth. In addition to your teeth being knocked out or damaged, other areas of your mouth can be injured as well. These areas include your gums, lips, cheeks and tongue. You will notice that these areas are injured if you experience any sort of pain, bleeding or swelling. If any of these symptoms do occur, you need to put warm water in a cup and rinse out your mouth with it. For bleeding, use moistened gauze and apply direct pressure to the area. If you don’t have any gauze on hand you can use a tea bag as well. Bleeding should stop in 30 minutes or less. If it doesn’t, or it tends to get worse, this is a dental emergency. For swelling, you can use a cold compress on the outside of the mouth or cheek. In conclusion, if your mouth hurts, it’s considered a dental emergency. You should not delay visiting your Los Angeles dentist as the problem can often get worse. The sooner you get into your cosmetic dentist to be seen, the greater chance you have of a better outcome. As young people become more and more active, it is also important that they become more cautious. When young people participate in fun activities such as basketball, swimming, football and skateboarding, they are putting themselves at risk of injury. Each year tons of unexpected injuries can lead to lost or damaged teeth. Although many of these injuries can be avoided, it is imperative to take quick action when they do occur. Dr. Louie, dentist in Los Angeles, sets aside specific times to treat this array of dental injuries. When playing a sport, it is very possible to lose one or multiple teeth. It is very important that if this occurs, patients quickly retrieve the dislodged tooth and put it in water to rinse. It is also very important not to remove any tissue during this process. Those who are injured also have the option of placing the tooth in a small cup of milk or salt water solution until they can get to the dentist. The quicker you get to a cosmetic dentist like Dr. Louie, the greater the chance of saving the tooth. Many people are surprised to learn that sports drinks along with energy drinks can also cause damage to a person’s teeth. Many studies show that the increase in the use of sports drinks has created a rise in irreversible damage to teeth. Many people began drinking energy drinks hoping to gain extra energy to help them with their athletic performance. They are convinced that these drinks are a great alternative to soda. However, the reality is that these drinks are loaded with acid that cause harm to teeth. When you consume these drinks, you are essentially bathing your teeth in acid. Educating the public about the downside of consuming sports drinks is an important next step. According to the Academy of General Dentistry (AGD), 30 to 50 percent of teenagers in the US consume energy drinks. Of that group, more than 62 percent consume at least one sports drink per day. That means a high percentage of young people are doing damage to their teeth on a daily basis. Many of these kids have no idea the effect a sports drink can have on their health. Many dentists recommend teenagers limit the consumption of these drinks. Also, they recommend chewing sugar-free gum. When they do consume sports drinks, young people should rinse their mouths out with water afterwards. Protecting your teeth is an important job which should be taken seriously. Taking precautions could ultimately determine just how bright your smile will be.